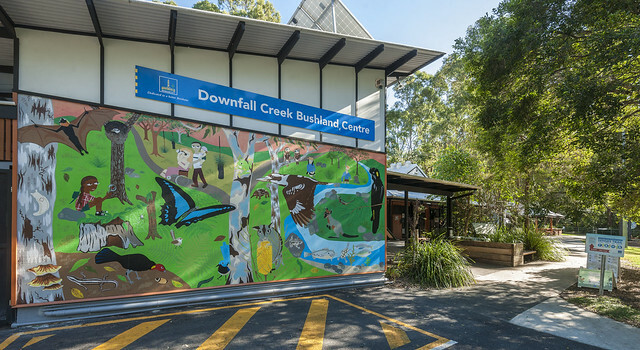 The Downfall Creek Bushland Centre is located at the Raven Street Reserve, part of the Chermside Hills Reserves. At the centre you can view environmental and cultural displays, learn about the reserve's flora and fauna, and discover the importance of preserving the natural areas of our environment. closed on Fridays, weekends and public holidays. Brisbane City Council's environment centre host a number of events throughout the year. From guided walks to children's activities there's something for everyone. Check out what's on at the Downfall Creek Bushland Centre. bike and walking tracks (the major tracks are wheelchair accessible). View the Downfall Creek Bushland Centre photo gallery as a slideshow below, or view photos individually as part of Council's Flickr account. People of all ages can use the Downfall Creek Bushland Centre to learn about the Raven Street Reserve and the importance of urban bushlands to the wider environment. walk the Hide 'n' Seek Children's Trail through the reserve. Before you go, or during your walk, you can download or view the trail map (Word - 1.46Mb). email the Downfall Creek Bushland Centre.